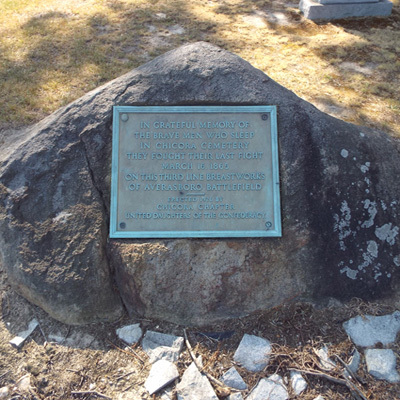 A bronze plaque attached to a large granite boulder marks the third line of Confederate defenses at the 1865 Battle of Averasboro. IN GRATEFUL MEMORY OF / THE BRAVE MEN WHO SLEEP / IN CHICORA CEMETERY / THEY FOUGHT THEIR LAST FIGHT / MARCH 16, 1865 / ON THIS THIRD LINE BREASTWORKS / OF AVERASBORO BATTLEFIELD / ERECTED 1926 BY / CHICORA CHAPTER / UNITED DAUGHTERS OF THE CONFEDERACY. Total cost unknown. $100 was contributed by the State Historical Commission. The Battle of Averasboro was a delaying action fought on March 15-16, 1865 against the Union army commanded by Maj. Gen. William T. Sherman. The Union army of 60,000 men was moving northward after having occupied Fayetteville and burning the arsenal located there. The 6,000 Confederate troops of Lt. General William Hardee were ordered to engage the enemy, giving General Joseph E. Johnston time to consolidate his forces for the major battle that took place at Bentonville on March 19-21, 1865. 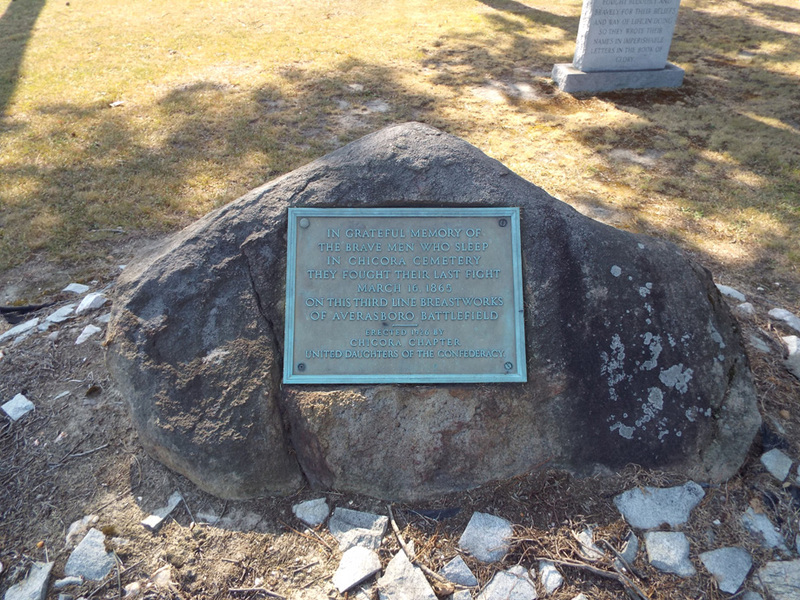 The marker sits to the left of the wrought iron fence that encloses Chicora Civil War Cemetery at the Averasboro Battlefield site (NC Highway 82, also known as Burnett Road). The marker is in front of the South Carolina Memorial and close to the North Carolina Memorial, McLaws Division Marker, and Battle of Averasboro Confederate Memorial. The Union Soldiers Memorial is also in the walking distance. The entire area, along with nearby plantation houses, is listed in the National Register of Historic Places. The Averasboro Battlefield & Museum site is located nearby, on the other side of NC Highway 82. The landscape is primarily agricultural, with sloping hills, streams and wide vistas. The marker sits on the grass behind the iron fence. The site continues to be used for Confederate Memorial Day services and battle anniversary events and re-enactments.